This collection of grief poems for a dead son is prefaced by an eloquent prose account of the author’s personal grief journey. 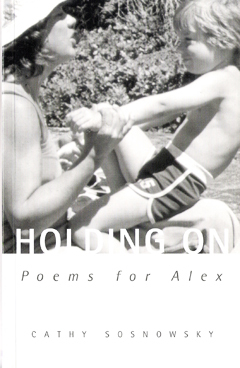 Written eight years after the accidental death of her only birth child, this essay describes her initial suicidal despair and the resources she called on for survival: her community of friends and family, the grief journeys of others, literary and religious history, nature, The Compassionate Friends (an international self help group for bereaved parents), and the act of writing itself. The poems that follow are culled from eight years of writing. Many of the most intense are cries from the first years of despair, while others mark the passing of time and the changing emotions and insights that evolved. Because of Sosnowsky’s background as a college instructor of English, many of her references are literary. These are explained in brief endnotes. The tone throughout is intensely personal, but because of the author’s ongoing involvement with other bereaved parents, also universal. A unique aspect of this collection is its use of the dead child’s drawings and photos for illustration. These have been beautifully integrated with the poems by prize-winning book designer Leon Phillips.